Arm yourself with the knowledge and tools to help you sell IBM® solutions and enable IBM clients to become innovative businesses enabled by on demand. 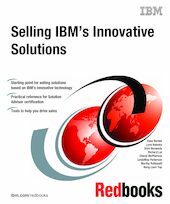 This IBM Redbooks publication serves as a practical reference for those who desire to understand the IBM innovation enabled by on demand and how to sell the IBM innovative technology. It provides the perfect starting point for those who want to integrate on demand business concepts into their selling practice. It also serves as a guide for anyone preparing to take the IBM Certified for On Demand Business Solutions Advisor V2 Exam via Test 818. You will understand the IBM Innovation enabled by on demand business strategy. You will be able to identify business opportunities and target markets. You will know how to sell solutions in line with the strategy. You will have the ability to articulate and sell solutions that support Innovation enabled by on demand business. You will understand how to be more adaptive to the dynamics in the marketplace.